FAQ Corner – What is turndown ratio? 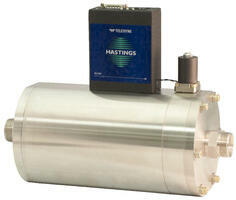 We are occasionally asked for the turndown ratios of our flow meters and flow controllers. There are varying perceptions as to what this term actually means. A flow meter with a large turndown ratio will have a large operating range. This can also be indicative of the flow meter’s cost. For example, variable area flow meters (rotameters) typically have lower turndown ratios compared to thermal mass flow meters. Most analog mass flow meters have an accuracy of ± 1% of Full Scale (FS) and have resolution better than 1%. The usable range is from 1% to 100%. They will have a turndown ratio of 100/1 or more commonly expressed as 100:1. Digital flow meters will have an even greater turndown ratio due to their higher accuracy. Most analog mass flow controllers also have an accuracy of ± 1% FS. However, they typically have an automatic valve shut circuit that closes the valve at flow rates below 2% of FS. This is to ensure full valve closure in the event of a small zero offset. The usable range is from 2% to 100%. Since measurement is not possible below 2%, these will have a turndown ratio of 100/2 = 50/1 or 50:1.